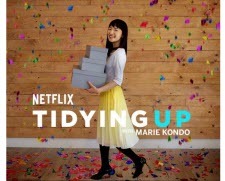 The "tidying up" philosophy of professional organizer Marie Kondo has reached fever pitch now that the best-selling author has a show on Netflix. The petite expert comes to people's homes and teaches them to go through a multi-step process of decluttering (the KonMari method). Step one is tackling clothes, mercilessly winnowing down your wardrobe to only articles that spark joy. But now that "Americans everywhere are tossing out their duds," as Meredith Fineman put it, is that good or bad for online sellers? To take a step back, it's fascinating to see the reaction to Kondo's teachings, especially the emotional and philosophical pushback, and the judgements about the excesses of "privileged" consumers. "At its heart, the KonMari method is a quest for purity. To Kondo, living your life surrounded by unnecessary items is "undisciplined," while a well-tidied house filled with only the barest essentials is the ultimate sign of personal fulfillment," wrote Arielle Bernstein in the Atlantic in 2016. But Bernstein says that while Kondo's guide to tidying up promises joy in a minimalist life, "in order to feel comfortable throwing out all your old socks and handbags, you have to feel pretty confident that you can easily get new ones. Embracing a minimalist lifestyle is an act of trust," one that people like Bernstein's parents and grandparents didn't have due to their circumstances. Book critic Ron Charles doesn't take kindly to Kondo's approach to books. "Keep your tidy, spark-joy hands off my book piles, Marie Kondo," he warned in this weekend's column in the Washington Post. "Suddenly people have noticed the dark side of Kondo's war on stuff: She hates books," he wrote. "We don't keep books because we know "what kind of information is important to us at this moment,"" Charles wrote. "We keep them because we don't know." Online sellers - especially those operating from home - may long for a system that can tame their cluttered storage and office space. At first glance, KonMarie wouldn't work for inventory, but sellers who use Amazon's FBA fulfillment service might relate to Kondo better than most. That's because Amazon began charging FBA long-term storage fees, meaning slow-moving inventory got more expensive. Note that in some categories you might call that "clutter," but certain items like rare books or vintage goods are slow-moving for a reason. At some point, it may be better to discount certain stock in order to free up room for faster-moving more profitable inventory. Can you take a more mindful (some would say brutal) approach to your business using Marie Kondo's methods? And to get back to the original question we raised, is Kondo fever resulting in better pickings at thrift shops and second-hand stores, providing an opportunity for resellers? Or will consumers decide they don't need to buy more stuff, which would be bad for retail? Well, I have a lot of books that honestly I don't know why I'm hanging onto them. After reading this I'm taking my books to the donation center. Be Gone -- BOOKS! Meh. I like my stuff. I will keep it, thanks. P.S. I noticed Marie Kondo is making a whole lotta money from telling people to throw stuff out. Where's she gonna put it? If it weren't for my craft supplies (including 2 huge piles of worn out antique quilts and a couple hundred pounds of fabric), my home would be rather tidy. And I'd be bored sh*tless. Tidy has a major drawback...the end of serendipity. No more finding something you forgot you had. I hate keeping anything around I don't need which is usually in the decision making process at point of sale or the deal breaker in it. Ina, I think this is a very good thing, sellers don't should't prefer their sales over recycling, and this not only makes people get a little bit of extra money ( to buy more stuff from sellers ), but is also much better than dumping the stuff who can be used by someone with a smaller budget. I will ask my mother in law ( a professional hoarder ) to watch it, she currently owns the biggest museum of useless stuff. Marie Kondo is selling. That's really all you need to know. Go to the self-help aisle at any book store. Same thing. All of these folks are trying to "fix" you and they are making money doing it. You can never get rid of too much "stuff." Having winnowed a 2-bedroom condo down to a moving van from SF to NY, I found that there was STILL so much stuff I could have gotten rid of before I had it hauled across country. We clean out our store stuff yearly. Try to donate to teachers, Goodwill etc. Problem is none of these people want to come pick them up. So if I have to load them in the truck then its off to the dump. Dumping is free. I don't have to listen to how grateful someone is when you know that they are lying. Many hundreds of dollars are headed that way this week. To the Dump the Dump we go. This means knowing what IS being collected now and what will sell and who your audience is. For that matter, apply that to new things as well. There IS a difference between hoarding and collecting. I only wish there were more books on displaying things effectively. My older co-workers de-clutter as a matter of course, because they don't want their children to have to do it. The children have little interest in what the parents collected and they don't have income to support space to keep anything in. I notice the advertizing trends showing overwhelming amounts of dolls or poking fun at people who have "things" instead of "experiences." Live and let live, geeze. As far as donating, I tried to donate a clean, five year old Ethan Allen chair of my husband's to the Goodwill. The man at the donation dock circled all around like he was judging an art exhibit. Can't blame them, a lot of what they get should have gone in a dumpster. They did take it finally. There's money to be made for sure, you just have to find people with the space for it. If you get rid of everything in your house, what are you supposed to do in your free time? Watch TV? Play games on your computer? It sounds like she is advocating the end of creativity and learning and wants to turn us all into automatons with boring lives. I dont need some "stupid women" telling me what to clean or not to clean/throw out. As a collector of many things - my house has stuff in it - but its not cluttered. Its all neatly in cabinets/show cases and its got nothing to do with what I sell. PERSONALLY, I dont need her help - maybe there are people who do - I dont. I collect LOTS of things - and they all give me great pleasure ... to bad on her! An endless vista of streamlined neutral colored everything is not for me. My grandmother called the look "Early Sterile." I thought it was funny and now I see what she meant. You won't trip over my skates or literally not be able to find ME in a room or sit down at a table, but have interests that can't just be folded up and shoved somewhere. Nor would I want them to be! Home=sanctuary and it should reflect you, nobody else. Personally, I have seen an influx of quality merch at the thrift stores lately. I don't know if it has anything to do with that show. It could just be the usual end-of-the-year, post-xmas donations. The things I have listed to sell are stored in my loft (carefully recorded so I can find something when it sells). The things "cluttering" up my home are those that bring back happy memories; those that I simply enjoy looking at; those I need to use once in a while; toys for my cats (I do have to watch where I step); and books . . . lots of books, some of which I have read many times. I'm currently reading a 30-year-old book (I just checked). And i remember my mother talking about "house proud" women whose uncluttered homes were spotless and sterile. No dust catchers for them! I noticed children seldom went to those homes to play. A lot of them came to mine. I'm not seeing an uptick in items of value that can be turned around and sold at a profit. All the thrift stores in my area already take any item of real value and put it on the internet, usually on eBay. The good stuff never makes it onto the showroom floor. I don't need some "smart women" telling me what to clean or not to clean/throw out. I have a wife of over 30 years for that. . . . . .
Kudo's to Marie Kondo for making her passion a success in business. . . .
20 years ago, I visited a lady antique dealer in her home that she shared with her mother. The yard was neat as a pin and the inside of the house as well. But nearly all the living space was taken up by the dealers inventory of antiques. Neat and clean but hardly anywhere to move or sit. I vowed to never let my home become a bursting at the seams warehouse for my inventory. So far so good but a visit by the resale shop truck is on the ''to do'' list.